Our traditional composite stable doors are great alternatives to standard front and back doors. Traditional appearance is combined with modern UPVC technology, providing the advantages of low maintenance, visual appeal and maximum security for your home in Newport. All our composite stable doors have been subjected to thorough tests to ensure they meet the required industry standards. Each stable door is manufactured to the highest of specifications, with advanced contemporary technology maintaining a traditional aesthetic. If you are looking for a highly secure door with an authentic appearance, then look no further. Both practical and attractive, they offer the ideal solution for a fast moving household. Stable doors have two independent opening halves which allow for quick and easy ventilation. These independent halves allow you to control the amount of air flow into your property, without putting your family and home at risk. The two halves of a stable door can also be interlocked to make use of a single door operation. This allows you to maintain a perfect level of privacy. These multi- functioning doors are ideal for a family household. 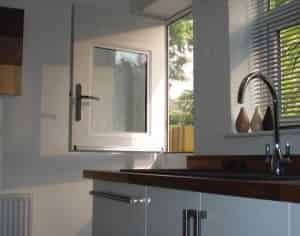 Their versatile opening arrangement allows you to keep a close eye on your children and pets whilst allowing fresh air into your home. Benefit from a greater level of security with our composite stable doors. 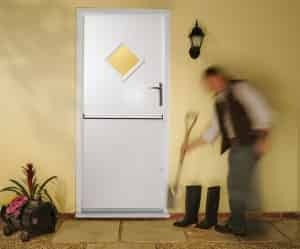 Made from a core of galvanised steel, stable doors are extremely strong. Anti-crowbar, these doors are incredibly hard to break into. Create your free stable door quote using our online quote calculator. Get a unique cost within minutes, simply enter your measurements to start your free, no obligation quote. Our composite stable doors provide beautiful, classic aesthetics. These country-style doors offer a traditional and cosy feel, enhancing the quirks and character of your property. Available in a wide range of colours and wood-grain finishes, we offer a striking selection of stable doors. Popular colours include Golden Oak, Chartwell Green and Wine Red. For a beautiful, smooth gloss finish we also offer a range of RAL colours.